Opened in 1977 by Robert Linxe (who was once referred to as a "ganache magician"), La Maison du Chocolat has several stores in Paris, and the house's world-renowned chocolates can also be ordered online. For those of you who aren't crazy about bitter chocolate, this is your shop-- La Maison du Chocolat never uses more than 65% cocoa in their confections, to avoid a bitter flavor. World-famous for their ganaches, this shop also specializes in truffles, mendiants (slices of chocolate topped with dried fruit) and bars with fruit or herbal notes. Chaudun is also a talented chocolate sculptor-- he once cast a chocolate mold out of performance artist Laurent Moriceau, which was then devoured by spectators at the Palais de Tokyo. This shop is simply de rigueur for chocolate lovers. Christian Constant has two shops in Paris, one close to the Luxemburg Gardens. His chocolate is rated by food critics worldwide as some of the world's finest, and he is particularly applauded for delicacies like raspberry ganaches, chocolate-covered orange peel, chocolates with spicy or herbal notes, or his famous "palet d'or", confected from fresh cream and dark chocolate. Christian Constant also offers a dazzling selection of cakes, pastries, and five-- count 'em, five-- decadent varieties of hot chocolate. Read more: David Lebovitz asks "Who is Josephine Vannier?" Undoubtedly the world's most celebrated pastry chef, Pierre Hermé has also won accolades for his line of gourmet chocolates. At the main shop in the St-Germain district, chocolate aficionados will find an incomparable selection of chocolate cakes, pastries, and macaroons, as well as unclassifiable confections like the famous "Death by Chocolate"--the name speaks for itself. 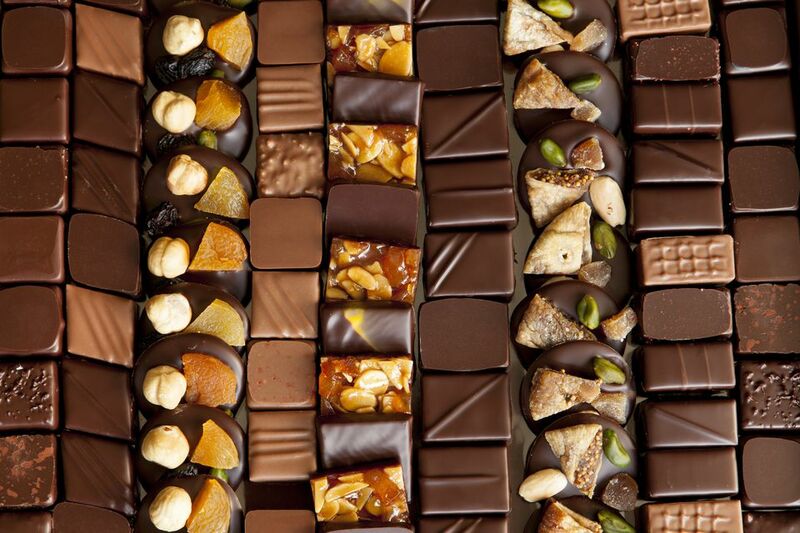 You can also sample varieties of chocolates sure to stimulate the palate, such as pralines with caramelized sesame seeds or ganaches with orange and balsamic vinegar. To the delight of chocolate aficionados, a new cocoa-centric concept store opened its doors in Paris in 2011, "Un Dimanche a Paris" (a Sunday in Paris). The brainchild of Pierre Cluizel (son of the aforementioned chocolate maestro Michel), the store has made the St-Germain-des-Prés district even more of a center of gravity for chocolate.